Our Little Dragons Kung Fu program is specially designed for children 7 to 12 years old. This program is designed to further the physical, mental and emotional growth of children through the movements and techniques of Kung Fu in fun and exciting ways. Each class is approximately 50 - 55 minutes long and designed to improve your child’s physical skills and enhance their ability to pay attention and follow directions. 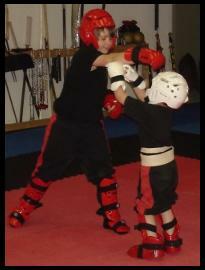 All classes are taught using the most safe, fun, and exciting instruction methods available for this age group. All the activities in the class are conducted in a safe, controlled and enjoyable environment utilizing age appropriate techniques to instill logical thinking, health and fitness, memorization, and social skills. Classes include blocks, kicks, strikes, and basic self-defense techniques taught in a safe, fun manner. Our Little Dragons learn self-discipline, but also when it is ok to be loud, relaxed and to have fun. In addition, our classes set young students on the path of lifelong physical fitness by showing them the joys of having improved balance, coordination, flexibility and strength through our Kung Fu skills, special games and activities. Every parent wants the very best for their children, and we all put a lot of effort into making sure our kids are well-prepared for life. The Little Dragons program at Twin Dragon is designed specifically to help your children develop the skills they will need to be successful in anything they try.